It happens every year, but every year you leave it way too late and end up with nothing on Mother’s Day. Stop the insanity of last-minute shopping and frantically running out to the shops the night before. Think ahead and show mum you know her better than she gives you credit for. Here’s an easy guide to help you figure out exactly what she’s after, even if she doesn’t play golf (YET!!!). Whether your mum is just getting into golf, already a pro on the links or not a golfer at all, Daily Sports offers up a variety of apparel options that slay on the course but also look incredible for everyday wear. Take a peek at a sample of our favourite looks from the brand. Is your mum really into improving her golf game? Then why not treat her to the latest technology that’s proven to help shave strokes off her scorecard. Check out our top tech loves to help get mum excited about her 2019 rounds! This lightweight and stylish watch will work on and off the golf course. 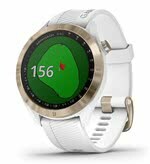 Help mum navigate the course in style with this GPS smart watch and colour touchscreen. The S40 features a ton of tech, perfect for helping her lower her score. This amazing training system is used by some of the best golfers in the world to help improve their drives. SuperSpeed promises to improve power and swing speed by 5-8% within six weeks of regular training. Each session takes about 10 minutes, so mum can easily fit it into her day. Whether she’s just starting out, or looking to upgrade a club or two in her bag, here’s a couple picks to make sure mum is at the top of her game. Give her everything she needs, and make sure mum enjoys her golfing journey by treating her to this amazing package set. Wilson have specifically designed the Prostaff HDX set to maximise distance, accuracy and help improve a golfer’s overall performance. This incredible club from Callaway offers all round performance plus consistent ball flight and an effortless swing. What more could she ask for??? Help mum get prepared for her 2019 rounds by treating her to a few of the basic essentials. 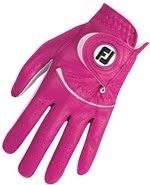 The FootJoy Ladies Spectrum Golf Glove is the perfect gift to ensure mum doesn’t lose that all-important grip. Crafted from premium cabretta leather, this glove is also fitted with an elastic aged powernet mesh for the ultimate breathable and comfortable fit. Available in a variety of bright colour options, you can be sure you’ll find the perfect one for her. These incredible golf balls from Nike have been specifically engineered for female golfers’ swing speeds. 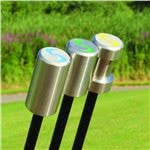 Promoting longer distance, higher launch and incredible feel, she will love playing with these. Help mum achieve the NXT level this summer by giving her a pair of Puma’s new Ladies Ignite NXT Golf Shoes. The spikeless design has been created from the ground up, allowing her to get the best grip, support and comfort throughout 18 holes.